Hudson-Odoi in action against Brighton. Image courtesy of Justin Setterfield on Getty Images. Chelsea manager, Maurizio Sarri was full of praise for winger, Callum Hudson-Odoi after he played a big part in his first Premier League start in the 3-0 win over Brighton & Hove Albion. The winger was causing problems for Brighton and got his reward when he got down the right and played the ball into the box for Olivier Giroud to open the scoring for The Blues. Hudson-Odoi has struggled to get many starts this season and seen his game-time come from the bench. The winger became the first player to start for England before he made his first start in the Premier League. Chelsea's boss, Sarri had admitted after Sunday's win over Cardiff City that he had only seen 15 minutes of Hudson-Odoi's start against Montenegro, which left some Chelsea fans red-faced. 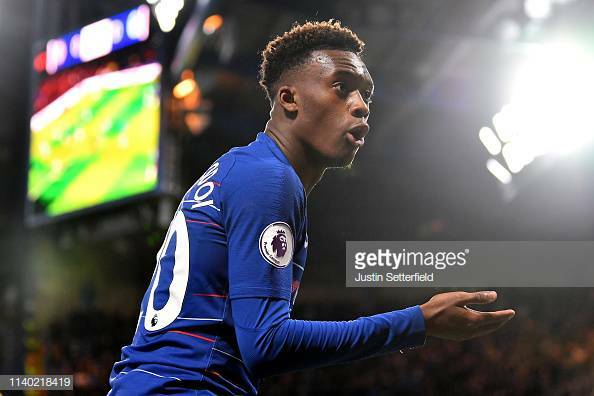 However, Sarri finally gave the 18-year-old his first start in the game against Brighton and Hudson-Odoi grabbed the opportunity with both hands. Sarri had the following to say on Hudson-Odoi: "Callum is ready to play in every match, even the most difficult matches. He improved a lot over the season. I am really happy for him. Not only in attack, but in defence. For this team, the future is could be good with Callum. "He needs to improve, he can improve, and I want him to improve. He can become one of the best players in Europe." Another player who put in a great performance last night was Loftus-Cheek. He got the assist for Eden Hazard's second goal and then he scored a spectacular third goal. Sarri had the following to say on Loftus-Cheek: "Loftus-Cheek for the first time in the season is without his problem in his back. In the last 20 days he was able to have training every day. "Today he played very well, he scored a wonderful goal. After 75 minutes he had a little problem with his hamstring, nothing serious, only cramp I think, but tomorrow I want to be sure about the situation with his back because that is the big problem."